(Nanowerk News) From visible light to radio waves, most people are familiar with the different sections of the electromagnetic spectrum. But one wavelength is often forgotten, little understood, and, until recently, rarely studied. It's called terahertz, and it has important applications in imaging and communications. 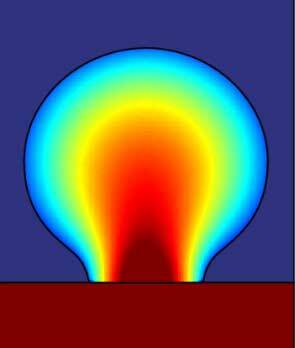 "Terahertz is somewhat of a gap between microwaves and infrared," said Northwestern University's Cheng Sun. "People are trying to fill in this gap because this spectrum carries a lot of information." Sun and his team have used metamaterials and 3-D printing to develop a novel lens that works with terahertz frequencies. Not only does it have better imaging capabilities than common lenses, but it opens the door for more advances in the mysterious realm of the terahertz. Supported by the National Science Foundation, the work was published online on April 22 in the journal Advanced Optical Materials ("Additive Manufacturing of a 3D Terahertz Gradient-Refractive Index Lens"). The design of Sun's lens with gradient refractive index. "Typical lenses -- even fancy ones -- have many, many components to counter their intrinsic imperfections," said Sun, associate professor of mechanical engineering at Northwestern's McCormick School of Engineering. "Sometimes modern imaging systems stack several lenses to deliver optimal imaging performance, but this is very expensive and complex." The focal length of a lens is determined by its curvature and refractive index, which shapes the light as it enters. Without components to counter imperfections, resulting images can be fuzzy or blurred. Sun's lens, on the other hand, employs a gradient index, which is a refractive index that changes over space to create flawless images without requiring additional corrective components. There are two major factors that made this new lens possible. First, it is made from a novel metamaterial that exhibits properties not readily available in nature. "Such properties originate from its tiny structures that are much smaller than the terahertz wavelength," said Fan Zhou, the paper's first author and member of Sun's laboratory. "By assembling these tiny structures, we can create specific refractive index distribution." Second, the lens was manufactured with a 3-D printing technique called projection micro-stereo-lithography. The technique enables a scalable, rapid, and inexpensive way to produce the tiny features that are needed for the lens to operate at the terahertz frequency band. The printing technology allowed the researchers to fabricate the metamaterial to precisely fit their designs. The 3-D printer in Cheng Sun’s lab allows researchers to fabricate materials that precisely fit their designs. It uses a photo-polymer in liquid form that coverts into a solid when light is applied. The material actually forms to the shape of the projected light, creating a 3-D structure. "For printing, we use a photo-polymer in liquid form," Sun said. "When we shine a light on the material, it converts it into a solid. The material forms to the shape of the light, allowing us to create a 3-D structure. You cannot accomplish a gradient index with traditional manufacturing processes." The lens could make terahertz imaging, which is particularly useful for security, cheaper, higher resolution, and more available. While X-rays can detect metal, they cannot detect plastic or chemicals. Terahertz scanners, however, can detect both of items to discover concealed weapons, biological weapons such as anthrax, and plastic explosives. And unlike X-rays, terahertz radiation is completely harmless to humans. "This advance means we can unveil previously inaccessible information of some opaque materials in high resolution," said Wei Cao, Sun's collaborator at Oklahoma State University. "This opens up an entirely new technique for a massive range of potential uses from biomedical research to security."